Recently I had an opportunity to watch a little more TV than usual. One of the shows I came across on Amazon Prime TV was American Epic, a three-part, award-winning documentary about the first recordings of rural music in the U.S.A. and their cultural, social and technological impact on the world. record companies in search of new styles and markets sought out regional musicians, from the streets of Memphis to the Western prairies and the islands of Hawaii. Using recent interviews, early recordings, and a wide range of period film, photographs and documents, many of them previously unknown or unpublished, American Epic explores the varied sources and extensive impact of this explosion of American popular culture. There is also an album of modern musicians doing many of the old songs from the series. Jack White and T-Bone Burnett are involved in the album project. All this music that the series covers is Americana before the name existed. I’ve read quite a few really good books about music; biographies, memoirs, compilations. 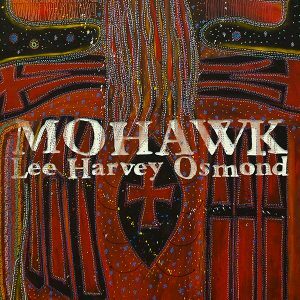 I think my favorite of them all, from last year, is “Beautiful Scars” by Tom Wilson of Blackie and the Rodeo Kings and Lee Harvey Osmond. 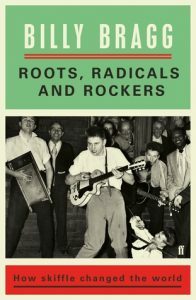 But my most recent music book is, “Roots, Radicals and Rockers” by Billy Bragg, subtitled “How Skiffle Changed the World.” It’s the story of skiffle music in the UK in the 1950s. Skiffle was a homegrown British music that started before Elvis in the USA. It combined New Orleans jazz with American blues artists like Lead Belly, and Lonnie Donegan became its greatest star. It was almost like punk rock in the ‘70s, but this music rebelled against crooners and the stuffy playlists of the BBC. I really enjoyed the book, made even better by the fact I got a chance to meet and talk with Billy Bragg on our recent Cayamo Americana Music Cruise. A cool way to read the book is to have whatever streaming service you have right next to you and play some of the songs and artists as you read about them. Highly recommended. One way to get notified about new music is by subscribing to the Americana Music Association’s weekly newsletter, This Week in Americana. There is an incredible amount of great new music coming out all the time. If you’re getting stale in your music listening, you’re just not looking very hard. We had a great weekend at BNHV, formerly the Amherst Museum, for Maple Weekend. We presented The Brothers Blue on both days at the end of March. This is a great northern Erie County location where we may be doing more events in the future. If you haven’t seen The Brothers Blue yet, look them up and get out to see them. They get better all the time, a fantastic rootsy, bluegrass trio. Celebrate Spring and the removal of the ice boom with the SAM Foundation on Saturday, April 27, in the historic Old First Ward neighborhood of Buffalo. All events are free, with food and drink available for purchase. 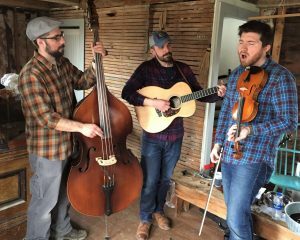 We’ll be providing the music at Flying Bison from 1 to 4 p.m. with Doug Yeomans and Lo Blu Flame and at Buffalo Distilling Company from 3 to 6 p.m. with Creekbend. Mark your calendar. Once again, SAMF will be providing the music and participating in Derby Day at Flying Bison Brewing Company on Saturday, May 4. We’ve got the Skiffle Minstrels, the full band with the clarinet, along with special guest Jim Bohm on trumpet. The music will be from 5 to 8 p.m., with the race at 6:15. Come out and hear great music and watch the Kentucky Derby at the best brewery in town. On Wednesday evening, May 22, the SAM Foundation will present the third annual $1,000 scholarship to a deserving Buffalo public school student with the Buffalo Jazz Workshop. The event will be at the Sportsmen’s Tavern. Be there for a great jazz show. Between April 27 and May 20, we’re providing tickets to 12 different shows and six different venues in WNY. See the list elsewhere in this issue.